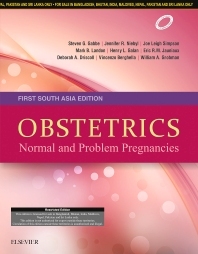 Obstetrics: Normal and Problem Pregnancies: First South Asia Edition remains your go-to choice for authoritative guidance on managing today’s obstetric patient. International experts put the latest knowledge in this specialty at your fingertips, with current and relevant information on everything from fetal origins of adult disease, to improving global maternal health, to important topics in day-to-day obstetric practice. Highly readable, well-illustrated, and easy to understand, this best-selling obstetrics reference is an ideal tool for residents and clinicians. • Sweeping updates appear throughout, including four new chapters: "Vaginal Birth After Cesarean Delivery," "Placenta Accreta," "Obesity," and "Improving Global Maternal Health: Challenges and Opportunities." • New Glossary presents the most frequently used key abbreviations for easy reference. • Expanded use of bolded statements and key points, as well as additional tables, flow diagrams, and bulleted lists, facilitates and enhances the mastery of each chapter. • More than 100 images in the chapter on ultrasound provide an important resource for normal and abnormal fetal anatomy. • Collective wisdom of global experts in the field is offered.